First Currently for the new year! Listening: My husband and I are on this crazy out of control watching frenzy of Breaking Bad. Oh, my! I honestly never wanted to watch this show. Teacher turn drug dealer . . . uh, no thanks! I have been totally sucked in by this major drama! Thinking: There are several projects that I need to get started on, but can't seem to get it going. Maybe, after Breaking Bad. Wanting: Google Glass! These are so cool. How cool would they be for a day in the life of . . . taking them on a field trip . . . pretty wild! Needing: I feel like I do a drive by reading of blog posts that I see in my Bloglovin' feed. My goal (not resolution) is to respond to more blog posts. I know I love when there is a response to something I've posted. Memory: Really, it's about creating memories! I just posted in my 13 in 13 linky post about our boat we purchased this year. It is so much fun! We love taking my daughter and her friends out on the lake. Creating experiences and making memories. Happy new year and be sure to head over to Farley's for some more Currently action! Hard question . . . we had to take breaks cuz it is pretty intense, but then we would get to the end of an episode and start the next! If you can get past the first 3 episodes. . . I am on a Hulu frenzy myself...McLeod's Daughters. That water dispenser is cool! I am going to keep an eye out for one. Enjoy your break! That is so funny my husband and I have been watching Breaking Bad like crazy on this vacation too! Here we thought we bought the final season 5 disc and watched them all to find out they split it into 2 disc. So ready to go out and buy the next disc to see what happens. We don't have Netflix! :( I also think Google glass looks awesome too. It's nice that these currentlys require us to visit and comment on others blogs because I totally hate it when I post and have no comments too. I do read lots of blogs on my phone or ipad and can't easily comment from there. It's nice to find new blogs to follow. We didn't know either! We have Apple tv (love it!) Just finished the whole series a bit ago! Sooo intense! Whew! Had to go run on the treadmill! I really love Farley's rule! Happy new year! Enjoy the rest of the series! Breaking Bad= Best. Show. Ever. I would definitely love a pair of Google Glass also. I started watching Breaking Bad, but only made it through five episodes. I need to get back in it. I'm excited that Netflix released the last four seasons of Dexter today! Oh, my gosh! Just looked up Dexter! Might be next on the list! You are reminding me that I need to watch Breaking bad! It's on my (long) list of box sets I need to get. The boat sounds like so much fun. We love spending time out on the lake, I read and my hubby fishes. Wishing you a great 2014! We usually have 5 giggling little girls so no reading for me! Need to have a lake date with the hubby! I love the look of your new crock pot. Isn't Jamie Cooks It Up blog wonderful. I have found so many good recipes from her. Jamie Cooks has a pesto bread that is next on my list to make! 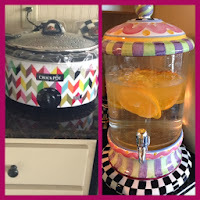 oh that is the crockpot I want... it is soooooo pretty!!! a family boat huh??? that is so much fun!!!! I think we need to have a summer blogger meet up on your boat!!! right?!?! thanks for always linking up!!! 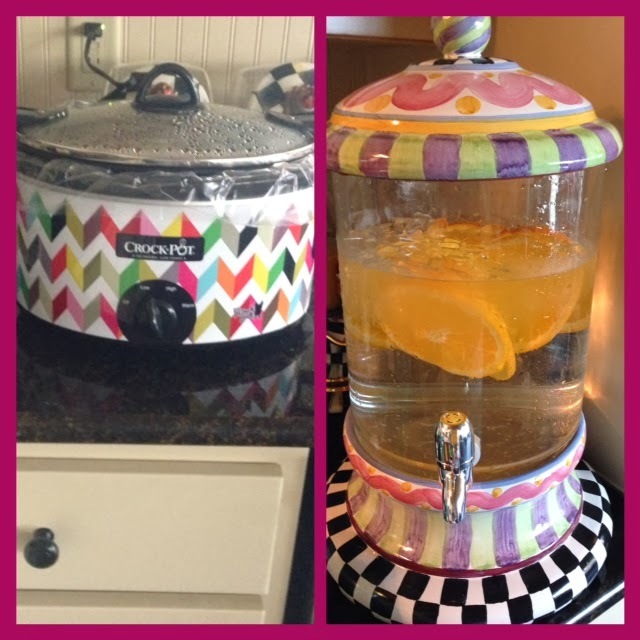 Love my crockpot! Boat is sooo fun. The hubby would be more than happy to be the boat captain for some fabulous bloggers! 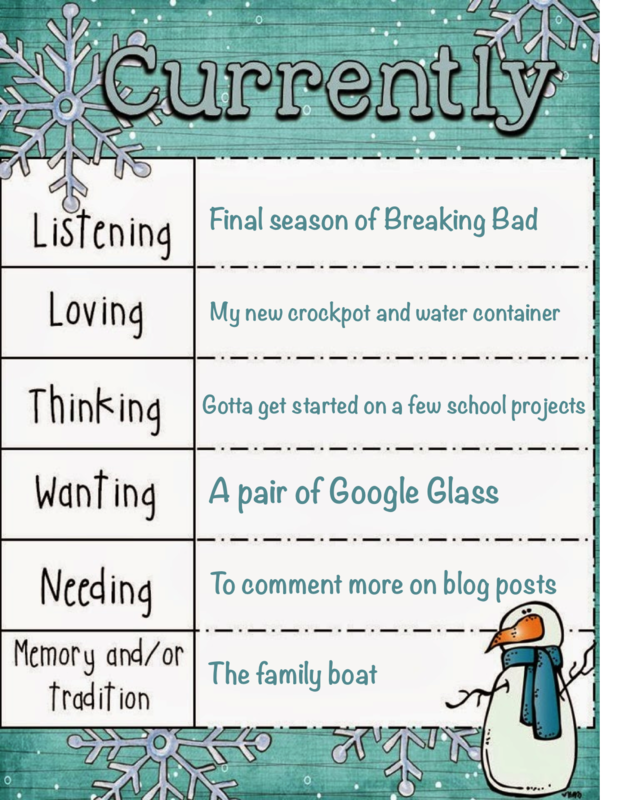 My goal for the year is to comment on more blogs too! There is usually never enough time in the day, is there? But I am on my 3rd snow day this week, so no excuses! Since I am buried in a foot and a half of snow right now and haven't left my house in four days, the thought of being out in the sun on a boat sounds heavenly! Oh, my gosh! I couldn't even imagine that much snow. We have been watching all the reports on the news. Sunday we are suppose to have a high of 75 degrees! Crazy. Thanks for commenting. My goal is...if I click on it...leave a comment!